An interesting article was written yesterday regarding the West Texas shale. Titled "Pioneer Bets on West Texas Shale Oil to Rival Bakken", this article speaks highly of the Wolfcamp Shale. "Everybody is going to be making a beeline to the Wolfcamp," said Scott Sheffield, CEO of Pioneer Natural Resources. The Bakken formation in North Dakota and Montana is well known but the Wolfcamp could be the next big U.S. play. The Wolfcamp is potentially the thickest onshore U.S. oil shale play with some areas having over 1,000 feet of pay. 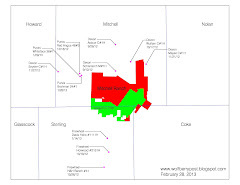 Pioneer, Devon, Apache, EOG, Chesapeake, Approach, Range and Concho are among those active in the Midland Basin. Lynden Energy Corp., although small relative to the companies mentioned above, has a large position on the eastern shelf of the Midland Basin. Their Mitchell Ranch project includes over 103,400 contiguous acres. They have a 50% interest in 68,400 net acres and 1.25% royalty over 35,000 acres that were farmed out to Chesapeake Energy. They have already had success with their Spade 17-1 well there and we believe it's only a matter of time before one of the majors comes knocking at their door. Once the market realizes this, LVL's undervalued share price can only go up!